As I’m touting this as an easy midweek supper, I’m using frozen fish and dried herbs, but you could of course use fresh in both cases. I’m a bit vague on the quantities and timings below, but it’s not a recipe that needs precision. (again, use your judgement on quantity with the olive oil, lemon juice, herbs, salt and pepper). 1. Peel and boil the potatoes until they are just very slightly on the undercooked side. 2. Pour the tomatoes into the bottom of a ovenproof dish. Mine is approximately 30cm x 24cm. 3. Season the tomatoes with crushed garlic, herbs, salt and pepper. 4. 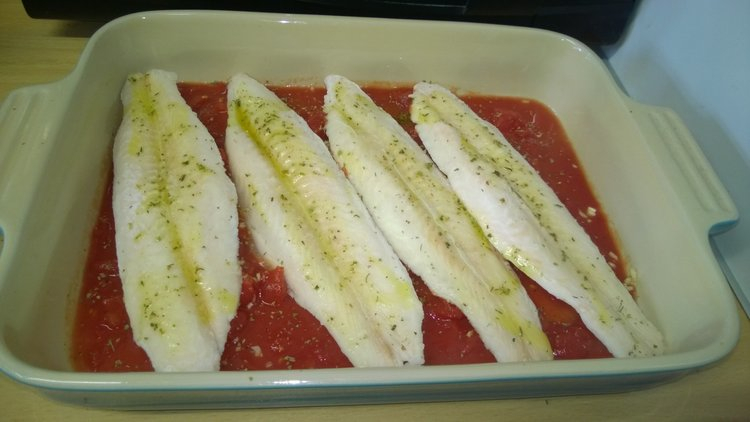 Lay the frozen bass fillets side by side on top of the tomatoes. 6. Place the potatoes around, filling the gaps where there are any. 7. Drizzle a bit more olive oil over the potatoes and sprinkle on a few more herbs. It should look something like this at this stage, except probably with less potatoes if you are only making it for two people as I was! 8. 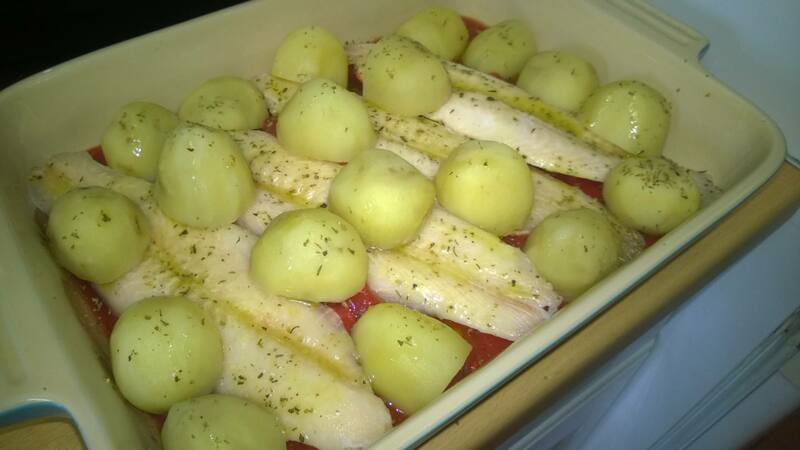 Cover dish with foil and bake at 180C/350F until the fish is cooked and the potatoes are fully tender. I forgot to time it, but I would say check it after 30 mins, less if using fresh fish. 9. Serve with a green vegetable or salad. Sorry the presentation isn’t great on this photo, but I forgot I was going to photograph it and just threw it all on the plates. It’s colourful at least! 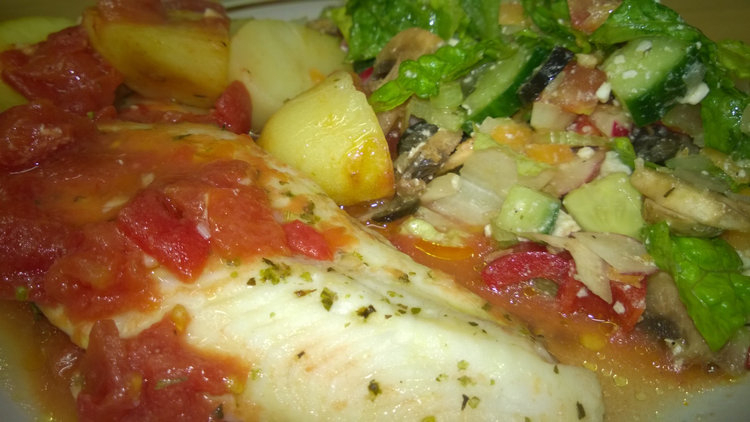 Yes, do try Basa, even if not in this recipe, it’s good done in any way that you would do white fish, I’ve usually got some in the freezer these days. Well, I will surely try it now know something positive about it. I thank you. I don’t eat fish (I wish I liked it; so good for us), but I’m going to try this with chicken. I’m always looking for new ideas since I don’t cook red meat. Thanks for the recipe! Actually I’ve done something very much like this with chicken before, but also added onions and mushrooms in – I considered adding onions and mushrooms to this one but then thought the fish might get a bit “lost” amongst it all, but with chicken being more robust, texture-wise, it can handle it 🙂 I do like dishes that you can throw everything together in one pot, and you just have to make a salad or something to go with it. Me, too, though my boys grumble more when I mix everything together. I’m slightly traumatised that you can’t be perfect ALL the time. Why didn’t anyone tell me about this fact? Will there be any warning when you are about to be, or have just been, less than perfect so I can prepare myself? Is this an evidence based fact, or just heresay (or even heresy as my spell checker prefers), or purely anecdotal? Yep, definitely easy! I really like fish with tomatoes actually, sometimes I make a chilli using fish instead of beef and it’s really nice, much lighter and better for a summer meal. The salad was a big mixture of lettuce, tomatoes, peppers, cucumber, celery, mushrooms, olives, onions and feta cheese (I think that’s everything), and the dressing was just olive oil, vinegar, salt, pepper, a crushed garlic clove and herbs. Thanks! That idea for fish in chili sounds great for a more summery meal. Perfect timing! I’m always happy with fewer cooking vessels than more—I’m not a big fan of washing dishes! This looks like a yummy summertime meal. Yep, throw it all into a pot and I’m happy!